The benefits of Royal Jelly are truly extensive. The list of benefits is so extensive that it may actually appear to be 'too good to be true' to many of us, myself included. I'm still amazed every time I scan the many studies done on this amazing substance. 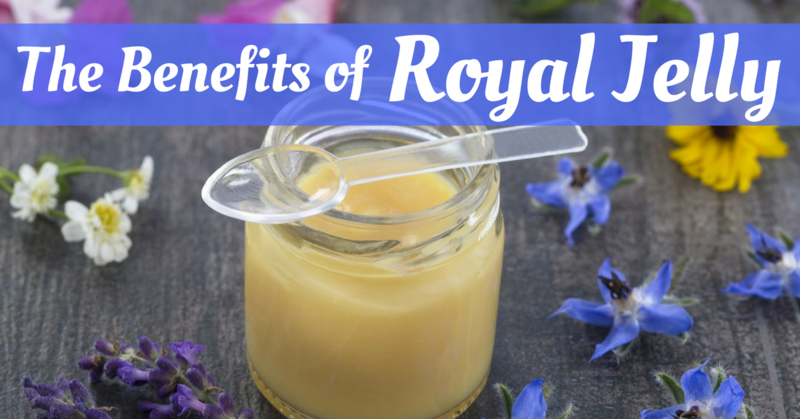 If you're looking for a quick list of how royal jelly may aid your health, I've compiled a list with links to the many benefits of this powerful substance. Please keep in mind that the majority of these studies have been done in animals and/or in a test tube so they should not be taken as absolute proof that royal jelly will treat our cure your condition. A group of researchers in Japan investigated the effect of certain peptides found in Royal Jelly on rats with elevated blood pressure. Giving the rats only a single dose of RJ orally, the researchers found that systolic blood pressure was reduced by just this one dose for eight hours. They concluded that the intake of RJ peptides, as a functional food would be beneficial for improving blood pressure in people with hypertension. 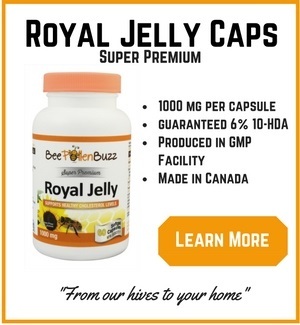 Of the dozens and dozen of royal jelly health benefits, this particular benefit could potentially save our health care system the most money. Hypertension drugs are among the most prescribed drugs in the world. Unfortunately, they have tremendous side effects. I recommend taking 4 - 6 RJ capsules or a half teaspoon of fresh RJ per day to promote healthier blood pressure levels. Royal Jelly Extends Life Span? Emerging research is really beginning to point to Royal Jelly as a life-extending nutrient. Up until now, only calorie restriction and possibly resveratrol (the compound in wine) have been shown to absolutely extend life span in multiple species, including humans. Researchers at the Fujisaki Institute in Okayama Japan recently set out to investigate the effect of Royal Jelly on the life span of mice. They did this by measuring the levels of DNA oxidative damage that occurred in the animals over 16 weeks of feeding them either royal jelly or nothing. Generally, the greater the amount of oxidative stress in your body the faster you'll age. Ingesting anti-oxidants is one one to combat oxidative damage. In the mice that were fed a dietary supplement of Royal Jelly for 16 weeks, the levels of 8-hydroxy-2-deoxyguanosine, a marker of oxidative stress, were significantly reduced. This is a very good sign and is indicative of royal jelly's anti-oxidant properties. The researches then determined the effect of dietary RJ on the life span of these mice - overall Royal Jelly extended the average survival time by about 25% compared to the control group. The researchers suggested that this life extending effect was likely caused by the anti-oxidant effect of Royal Jelly. The group of scientists that have recently shown that royal jelly has potent anti-allergic properties in mice decided to do further research to determine just what it is in RJ that has this effect. This is important because either an underactive or overactive immune system is not desirable. An underactive immune system leads to increased chances of getting diseases such as cancer or even just getting the cold or flu more often. An overactive immune system can lead to auto-immune issues such as lupus or rheumetoid arthritis, among others. Essentially, your immune system is confused and attacks itself. So, as you can see, the importance of a healthy, balanced immune system can not be overstated. Take two 1000 mg capsules per day or one quarter teaspoon of fresh RJ to help ensure a healthy immune system. A group of scientists at the Fujisaki Institute in Japan looked into whether Royal Jelly suppresses the development of atopic dermatitis-like skin lesions in mice. They repeatedly applied picryl chloride (an explosive compound used to cause inflammation) to the mice while feeding them RJ orally and found that it did indeed inhibit the development of dermatitis-like skin lesions in these mice. Royal Jelly has been shown in many studies to have anti-inflammatory characteristics. Most people don't realize that most skin conditions like dermatitis or eczema or psoriasis are just that - inflammatory conditions of the skin. ***My article on how to use royal jelly for dazzling skin health can be found here. An experiment was conducted at the Jordan University of Science and Technology to determine whether royal jelly combined with progesterone cream could improve pregnancy rates in ewes (an ewe is a female sheep for those of you wondering). Thirty ewes were randomly allocated into groups of 10 ewes each. They were then bred with male ewes and tested to determine ovulation times as well as pregnancy rates. What they found was that Royal Jelly, when used in conjunction with progesterone, definitely improved pregnancy rates. While this study was done on animals, it does support the large amount of anecdotal evidence regarding the hormonal balancing properties of royal jelly. I'm a big fan of using bioidentical progesterone for fertility, having used it for both of my pregnancies. Work with a bio-identical hormone specialist to determine if it is right for you. Scientists at the POLA R&D Laboratories in Yokohama Japan investigated the anti-fatigue effect of fresh royal jelly in mice. The mice were accustomed to swimming in an adjustable-current swimming pool, then subjected to forced swimming five times during a 2 week period. During the forced swimming, the total swimming period until exhaustion was measured. They were separated into three groups which were administered standard royal jelly, fresh frozen royal jelly stored at 40 degrees C for 7 days, or the control solution before swimming. What they found was that the swimming endurance of the mice taking royal jelly significantly increased compared to the control group that took nothing. If you're an endurance athlete, you'll be interested in this. The mice in the RJ group showed significantly decreased accumulation of serum lactate and serum ammonia and decreased depletion of muscle glycogen after swimming compared with the other groups. 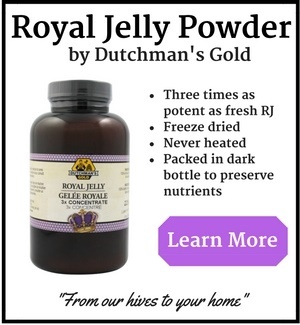 To be honest, I was not aware that Royal Jelly had liver protective abilities until I read this study. And don't ever underestimate the importance of keeping your liver healthy - everything you ingest goes through it to be filtered. So your liver is ultra important to your overall health. I've met many people with toxic or impaired livers and it is a very challenging health situation which can often lead to liver cancer. Simply drinking tap water today will expose your liver to over 200 toxic compounds alone. This makes the protective effects of Royal Jelly even more important. Conditions such as Dementia and cognitive decline are rapidly increasing with the aging of society. As a result, the quest for nutrients that can slow or even reverse these conditions has dramatically accelerated in recent years. Scientists recently set out to determine if royal jelly can in fact stimulate the regeneration and growth of brain cells. In order to simulate the death of brain cells, they administered a very potent, toxic compound call TMT to rats which killed off large numbers of cells. In humans, one would normally see large numbers of brain cells die with advanced age and conditions such as dementia. This group of scientists had already shown in a previous study that royal jelly facilitates neuro-genesis (regrowth of brain cells) in a test tube. Testing their findings in rats was a logical next step. The rats were exposed to the TMT and then given royal jelly orally. Interestingly, they found that orally administered royal jelly significantly increased the number of brain cells in certain parts of the brain and simultaneously improved the cognitive impairment caused by the drug. Based on these results, the scientists suggested that royal jelly may serve as a tool for protection against and therapy for some neurological disorders such as depression. It would make sense that Alzheimer's and Dementia be on this list as well. As part of the brain protection protocol I recommend for my clients, I include 2000 mg of royal jelly per day. It is important that your royal jelly contain at least 6% 10-HDA as this is the compound in royal jelly that is thought to be causing the results in the studies. I also recommend a product called Brain Smart and Omega 3 Fatty Acids from fish oil. To read the entire study, see Evidence Based Complementary & Alternative Medicine, April 17, 2009. Ladies, this should be very exciting news to you! According to a study published in the journal Complimentary Therapies in Medicine, taking only 1000 mg of royal jelly per day reduces PMS symptoms significantly. If you are one of the 30 - 40% of women who suffer some type of daily impairment due to PMS, this study could not have come at a better time. These are some serious symptoms, many of which often require medication. The study was a randomized, triple-blind, placebo-controlled clinical trial, which was conducted in the Tehran University of Medical Sciences between December 2011 and October 2012. The study population comprised 110 students with PMS. Each participant in the intervention group took one Royal jelly capsule orally per day, starting on the first day of menstruation and continued the same treatment daily throughout two consecutive menstrual cycles. Participants in the intervention group took placebo capsules. Results were measured in the study using a PMS Score as obtained through the Premenstrual Profile 2005. This is simply a rating system designed to standardize the unique PMS symptoms experienced by the participants so that the effects of royal jelly could be accurately quantified. Taking only 1000 mg's of royal jelly per day for two full months provided significant relief for the ladies in the study. With the study being a randomized, triple blind trial, these results can be considered very reliable and trustworthy. Triple blind studies are considered the gold standard of scientific trials. The full study can be found in Complement Ther Med. 2014 Aug;22(4):601-6. The benefits of royal jelly include better blood sugar control along with the reduction of oxidative stress. Oxidative stress is thought to be involved in the development of cancer, Parkinson's disease, Alzheimer's disease, Atherosclerosis and heart failure. Generally speaking, if you don't have enough anti-oxidants in your body, you will have high levels of oxidative stress. Keeping this in check is an absolute must if you want to remain healthy. Reported in the Chinese Journal of Integrative Medicine, scientists recently set out to find out how true this was and to what degree. In this study, 50 female volunteers with type 2 diabetes were randomly given a daily dose of a 1,000 mg royal jelly soft gel or a placebo for 8 weeks. Before and after blood sugar control indices, antioxidant and oxidative stress factors were measured. After royal jelly supplementation, the blood sugar levels of the participants decreased by levels termed by the scientists as "remarkable." Royal jelly supplementation also resulted in a significant reduction in glycosylated hemoglobin levels. This is a very good indicator of the average blood glucose levels over the previous months prior to the measurement. Diabetes drugs like Metformin do the same thing. Royal Jelly also raised two very powerful anti-oxidants, superoxidase dismutase and glutathione peroxidase, while decreasing oxidants in the blood meaning less 'aging' was occuring in those with the supplement. 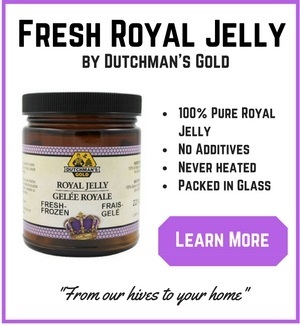 With these results occuring at only 1000 mg's per day, royal jelly is proving to be very low cost health insurance! According to statistics, one third of the people over 60 have recall problems and a quarter of those over 85 suffer from a serious loss of memory. Clearly, Alzheimer's Disease and Dementia are reaching epidemic proportions as our population ages and recent surveys suggest that 'losing one's mind' is the baby boomers' number one fear. Furthermore, according to the American Association of Retired Persons, the number one priority of 94 percent of people as they age is "keeping my brain sharp." With huge numbers of people suffering from memory loss and millions more worried about keeping theirs, natural solutions to this growing problem are now being investigated. One such study evaluated the behavioral and neurochemical effects of giving 'old' rats royal jelly orally for two months. They were given either 50 mg/kg or 100 mg/kg of body weight per day. This would equate to between 3400 and 7200 mg's per day of royal jelly powder for a 150 lb person. This is a reasonable amount of royal jelly and equates to roughly one teaspoon of a quality freeze dried royal jelly per day. Researchers assessed the rats spatial memory using the water maze along with neurotransmitter levels, their metabolites and utilization in the selected brain regions to determine if royal jelly did in fact improve brain function. What the researchers found was that in the rats given royal jelly, an improvement in memory occurred along with an increase in the concentration of neurotransmitters. Neurotransmitters help the cells in your brain 'communicate'. Rats certainly aren't humans and undoubtedly, human studies are needed to validate royal jelly's effectiveness in supporting memory as we age. But the body of evidence supporting the idea that royal jelly can improve brain health is growing. From other animal based studies we know that royal jelly boosts the regeneration of brain cells and we also know it can help with depression and anxiety. As part of a comprehensive brain health protocol, I recommend 3500 mg's of royal jelly powder per day. I also recommend omega 3 fatty acids (EPA and DHA) along with nutrients such as acetyl-l-carnitine, turmeric and blueberry extract. This unique combination can be found in a product I recommend called BrainSmart. The full study can be found in the Journal of Ethnopharmacology, 2014 May 29.